I love Thanksgiving - I love cooking, and hosting dinner parties, and I love eating foods that bring back memories from my earliest years of eating Thanksgiving dinner with my grandparents. And when people ask what a vegetarian eats on Thanksgiving, I can't help but laugh, because I eat SO MUCH! I have never felt like I am "missing out" by leaving the turkey out of my Thanksgiving dinner. This year I'm staying in New York for the holiday, and hosting dinner at my apartment. So I've been spending the afternoon prepping things for tomorrow, cooking anything that can be made a day in advance and heated up again so there is less to do and less fighting over oven and stovetop space tomorrow! This is the loaf before it goes into the oven - I made a half-recipe because we're having a smaller group of guests this year. 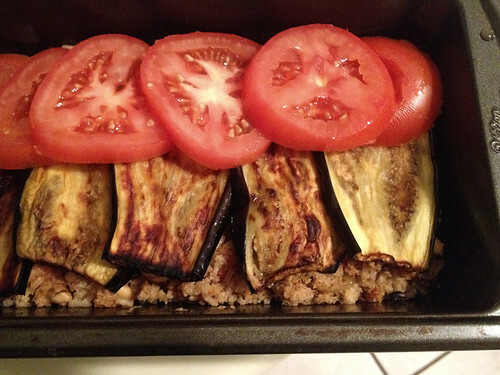 And I put a second row of tomatoes on top after I took this photo, but I wanted you to be able to see the yummy eggplant first! 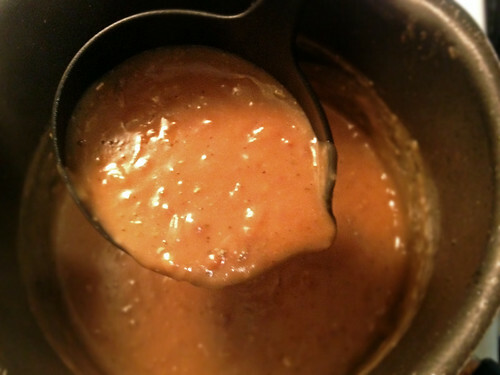 Even meat-eaters love this gravy! My family used to make two batches of gravy each year, one vegetarian and one non-vegetarian, but recently we've switched to just making the vegetarian one, because everyone likes it anyway! Tomorrow I'll make the roast potatoes and root vegetables, peas, rolls, my grandmother's sweet potatoes (topped with vegan marshmallows from Sweet & Sara) and pumpkin pie! What are you cooking for Thanksgiving this year?